Give UK artist Patrick Vale 80 seconds, and he'll show you his freehand drawing of New York City unfold in rapid-fire motion. Vale planted himself on the 102nd floor of the Empire State Building, looked outside his window, and began drawing, with his iPhone duct taped to a rostrum and recording the action. From start to finish, the drawing took, he says in a HuffPo interview, four to five days. He calls the drawing of the Manhattan skyline "Empire State of Pen." The great Charles Mingus provides the soundtrack. Follow us on Facebook, Twitter and now Google Plus and share intelligent media with your friends. You won't be sorry! 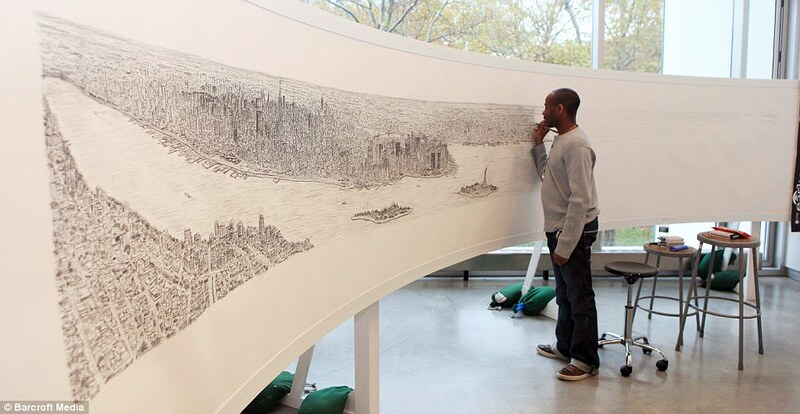 That’s amazing, but not as amazing as Stephen Wiltshire. He took one 20-minute helicopter ride above New York and drew this from memory. Seriously, Google this man and his work.